I had another operating session last night, trying out some new ops software & some other things. I'll do a more detailed post on that later, but for now I want to encourage you & your operators not to be afraid of BO. Any operating session can result in some minor damage to cars, faulty couplers, etc, or just plain glitches that - thanks to Murphy & his Law - only crop up when folks visit to run the layout. Whenever those problems occur, the solution is to do what the prototype railroads do - pull the car for later repair. I've designated a drawer for such cars - keeps then out of the way and makes it easy to transport them up to the workbench. Here's the crop from last night, sitting next to me ready to get fixed. Great idea, Chris. 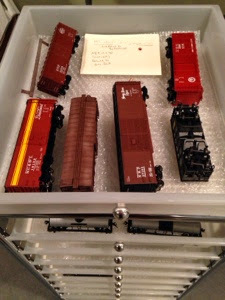 I might have one car after a session that requires a bit of attention (but I don't have that much rolling stock) so I can keep track of it, but if I had more rolling stock in the game I'd be stealing this idea. To be fair, 2/3 of these cars were in for coupler issues - and that's builder error rather than user error. I thought the manufacturer's press-fit coupler box covers would work fine. I was wrong :( Another car had a roofwalk pop off (manufacturer error). Only one car was user error - a broken-off brakewheel, easily repaired. Considering last night's session was actually *two* back-to-back sessions which moved a total of about 100 cars, I think we did quite well! I think you did too! Of course, I was joking about your operators.